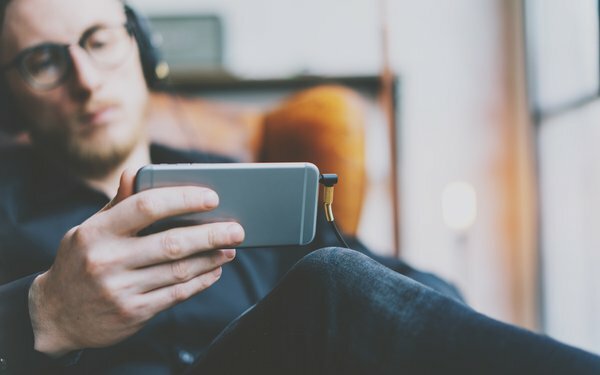 Pivotal Research Group, in its analysis of Nielsen data, says there were gains of near 50% earlier in the year for internet-connected device (ICD) viewing. Share of viewing on internet-connected devices was 16.5% for adults 18-49 during November 2018, 11.9% in November 2017 and 8.4% in November 2016. Looking at U.S. TV households, the viewing shares on ICDs were up 11.4% in November 2018, versus 8.1% for the same month a year ago. 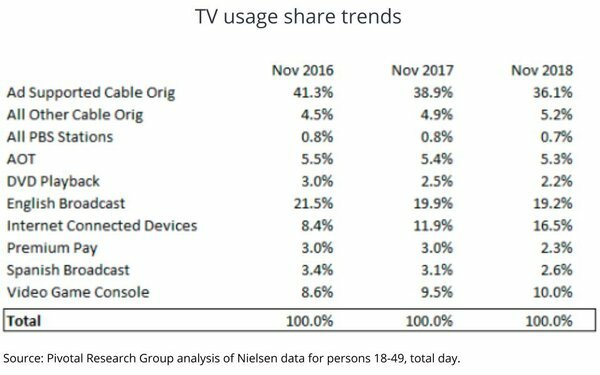 The bigger viewing picture, Pivotal says, shows total U.S. TV usage from all measurable Nielsen sources was virtually flat versus a year ago, up 0.2% for average household viewing. Analyzing just adults 18-49 shows, viewing fell 3.8% in total day; and down 4.2% in prime time. Narrowing the picture further -- just U.S. ad-supported cable networks and English-language TV networks -- shows adults 18-49 viewing down 10.0% in prime time, and a 9.5% sinking on a total day basis, when looking at Nielsen C3 ratings, the average commercial minute rating plus three days of delayed viewing. This was “slightly better than the last few months but broadly similar to longer-term trends,” writes Pivotal’s Brian Wieser. But Pivotal cautions that all data generally excludes programming running on devices other than TV sets, such as computers, tablets and mobile phones, if that programming was not encoded for commercial ratings. Also, viewing of content on OTT devices -- through VOD or gaming consoles over a conventional TV -- is only attributed to individual networks if programming is encoded for commercial ratings, with commercial pods matching a network’s linear feed. “Viewing trends would likely look much better if related data were widely measured and syndicated,” says Wieser. For November, he adds, advertising loads for the average U.S. network were somewhat stable at 11.2 minutes per hour versus increases in recent months. 2 comments about "Device Viewing Rises, Total TV Usage Flat". Ed Papazian from Media Dynamics Inc, December 18, 2018 at 11:36 a.m. Very interesting, Wayne. Is it possible to posta link to Brian's report? Thanks. Douglas Ferguson from College of Charleston, December 18, 2018 at 3:49 p.m.
PBS made good sense before the proliferation of channels. Not so sure nowadays.